WE used the quilling tool to create the flowers shown above. 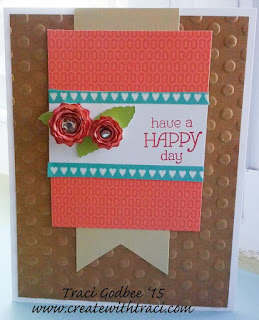 CTMH has a video on using the quilling tool and I thought I'd show that here. When I use the quilling tool to create these flowers... I also use my trusty liquid glass. After rolling you'll be left with a "roundish" flat surface. Apply liquid glass liberally and push your rolled flower into the glass, hold for a minute to allow it time to "stick". Practice makes perfect. You can cut these spiral flowers from either Art Philosophy or Artiste. There are different designs on each.